Local just doesn’t speak for the food, which we will get to later, it’s about the art too. Across from the entrance is a mural which looks to have been drawn on a chalk board wall that highlights one of Irvington’s best attributes– the Halloween Festival. Every autumn booths line Washington Street filled with crafts, food and clothing waiting for ghosts and goblins to wonder in and out. 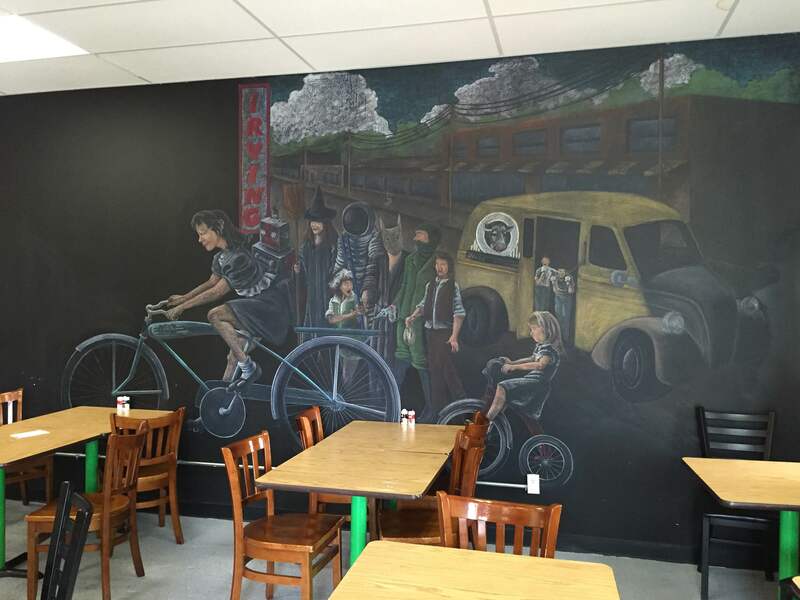 The mural on the wall at Your Local Deli & Market is a scene right out of the festival. A witch, an astronaut and a robot are just a few of the characters scene walking on Washington Street along with images of people pulled right out of historic Irvington pictures. The menu is on a chalk board wall behind the register and glass casing. The soups, salads and sandwiches listed on the colorful board are all made in house. Just below the signage you can watch as the meat is cut for your sandwich and your salad is made. In the glass casing sits the house made broccoli salad, pasta salad, cole slaw and the meat, ready to be cut. I ordered half of the Chipotle Chicken Sandwich without bacon, (I know I’m crazy) and half of the Summer salad. My dad, a native Irvingtonian, ordered The Irvington and my cousin got the Rueben. While we waited for our sandwiches shelves with jams and spreads caught my eye. Salsa, cucumber mint jelly and strawberry vinaigrette lined the shelves all made in house. They don’t mess around with local in here. Our food arrived and it was your typical deli presentation. No bells and whistles just great food. My summer salad was a bed of leafy greens– not a piece of iceberg lettuce in sight, topped with candied walnuts, beautiful red strawberries and chucks of creamy blue cheese. 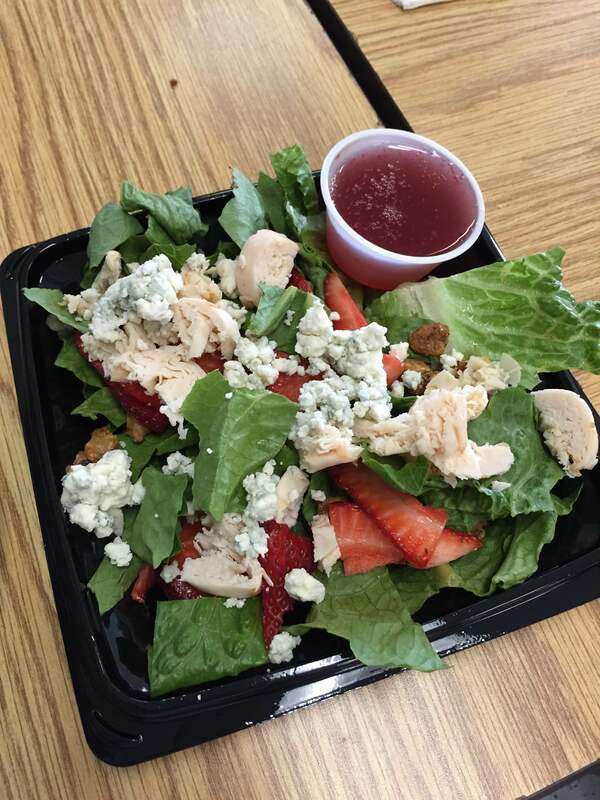 The house made strawberry vinaigrette was sweet with the right amount of tang to match the blue cheese. My sandwich had spice, but the right amount not to overpower the Boar’s Head chicken. The greens on the sandwich matched those on my salad plate. The Rueben and the Irvington were stacked high on marble rye bread and everything you’d expect from a great sandwich. Your Local Deli & Market will become just that, yours. It’s the perfect spot to pop in for a great lunch or swing by for their house made spreads and salads to savor all week. With the friendly staff it won’t take long for you to feel like a regular.